Satellite images Kiev published as ‘proof’ it didn’t deploy anti-aircraft batteries around the MH17 crash site carry altered time-stamps and are from days after the MH17 tragedy, the Russian Defense Ministry has revealed. 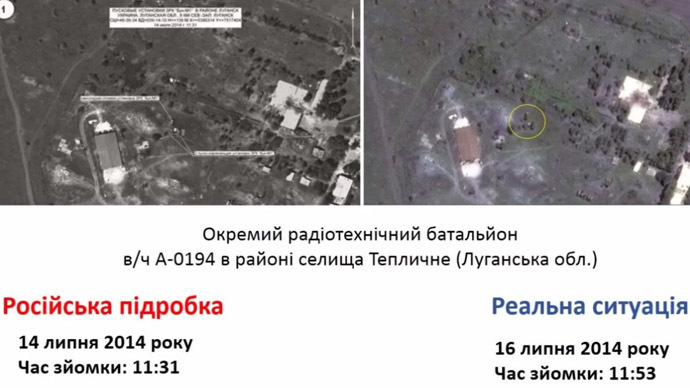 A comparison of satellite images published by Russia and Ukraine as presented by Kiev in an attempt to dispute the authenticity of Moscow’s photos. The shadows are cast in different directions in the two images, proving that they could not have been almost at the same time two days apart, as indicated by the time stamps. The weather is also clearly different, with the Russian image showing a cloudy day, while the image presented by Kiev shows a clear day - showing that the images could not have been taken less than an hour apart, as claimed by the time stamps. The Russian military say the actual weather conditions at the time can be easily double-checked by independent sources. Malaysian Airlines flight MH17 crashed in Ukraine’s Donetsk Region, which is engulfed by armed hostilities between Ukrainian troops and local militias. The plane was apparently shot down by a missile, although neither the type of missile nor who shot it has yet been properly established. As a troubled investigation into the tragedy, which claimed almost 300 lives, is underway, Kiev and some Western countries were quick to say that the militias and Russia were culpable for the deed. Kiev said it had no capabilities to take down the plane. The Russian Defense Ministry published satellite images and radar data, saying that evidence proved that Ukraine had both ground-based anti-aircraft batteries and military aircraft capable of firing an air-to-air missile deployed in the region on the day of the MH17 shoot-down. Some days later Kiev published its own set of images, claiming that those released by Russia were false.